There are exceptions to these rules and there are other rules beyond these 69. 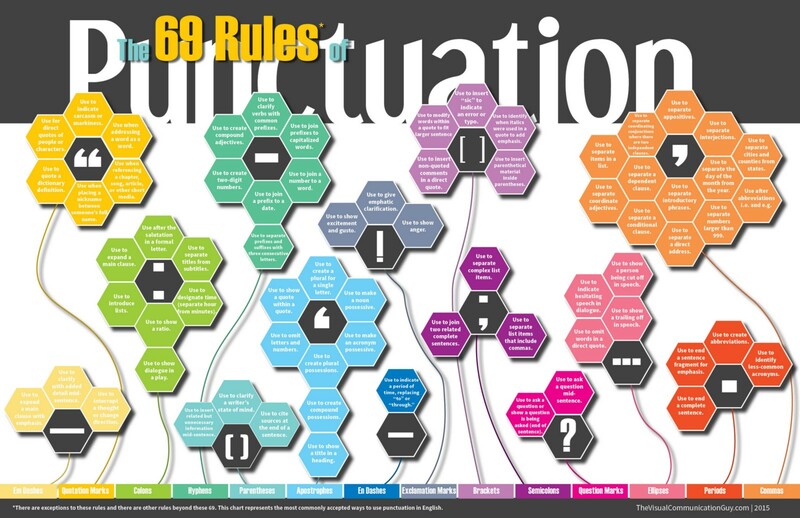 This chart represents the most commonly accepted ways to use punctuation in English. Use to interrupt a thought or change direction. Use for direct quotes of people or characters. Use to indicate sarcasm or snarkiness. Use when addressing a word as a word. Use to separate prefixes and suffixes with three consecutive letters. Use to join a prefix to a date. Use to create two-digit numbers. Use to create compound adjectives. Use to clarify verbs with common prefixes. Use to join prefixes to capitalized words. Use to join a number to a word. Use to clarify a writer’s state of mind. Use to cite sources at the end of a sentence. Use to create plural possessions. Use to omit letters and numbers. Use to show a quote within a quote. Use to create a plural for a single letter. Use to make a noun possessive. Use to make an acronym possessive. Use to create compound possessions. Use to show excitement and gusto. Use to give emphatic clarification. Use to insert non-quoted comments in a direct quote. Use to modify words within a quote to fit larger sentence. Use to insert “sic” to indicate an error or typo. Use to identify when italics were used in a quote to add emphasis. Use to insert parenthetical material inside parentheses. Use to separate a list of complex items. Use to separate list items that include commas. Use to join two related complete sentences. Use to ask a question mid-sentence. Use to ask a question or show a question is being asked (end of sentence). Use to indicate hesitating speech in dialogue. Use to show a person being cut off in speech. Use to show trailing off in speech. Use to omit words in a direct quote. Use to end a sentence fragment for emphasis. Use to identify less-common acronyms. Use to end a complete sentence. Use to separate cities and counties from states. Use to separate the day of the month from the year. Use after abbreviation i.e. and e.g. Use to separate numbers larger than 999. Use to separate introductory phrases. Use to separate a direct address. Use to separate a conditional clause. Use to separate a dependent clause. Use to separate coordinate adjectives. Use to separate items in a list. Use to separate coordination conjunctions where there are two independent closures. I think this infographic has a lot of important information in it, but the format is hard to read. If the infographic were larger, I think it would be more effective. It would definitely be a good poster to have at a desk, if you’re doing a lot of writing, but you would have to print a larger version for it to be useful in any way. Besides the size, the information it includes is useful because punctuation can be confusing, especially if you haven’t taken and English class or written a paper in a long time. I agree that the infographic was tough to read with the color scheme and the size of the font, so it was helpful that the transcript was provided. I never knew the difference between a hypen, en dash, and an em dash. The information was very helpful in clarifying the differences not only in the length of the dashes, but also in the usage of hypens, en dashes, and em dashes. Overall, it was a good refresher on the different uses and cases that each type of punctuation is used in. I think the information was better explained in the description than in the infographic. An infographic should be quick and easy to read, used at times where someone might not want to read an entire document on the information. Other than that, I found the information on the punctuation super helpful. I like how some of the descriptions explain how the punctuation can be used for story telling such as how the quotation marks can indicate sarcasm.